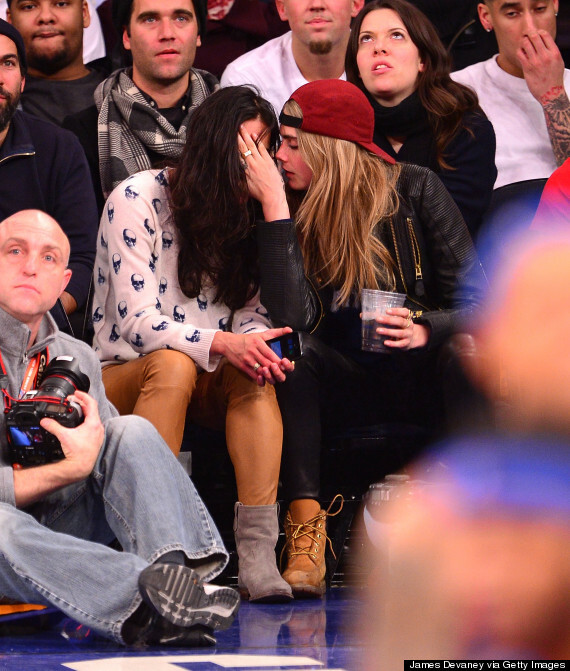 Just weeks after touching tongues with Miley Cyrus, Victoria's Secret model Cara Delevingne got very cuddly with actress Michelle Rodriguez at the New York Knicks game on Tuesday (Jan. 7). It was a close game for the Knicks, who beat the Detroit Pistons by just four points, but photographers appeared to be more interested in what was happening courtside as Delevingne and Rodriguez got touchy-feely. The pair looked very cozy together with Rodriguez's leg draped over the 21-year-old fashion model's long limbs. At one point they even shared a kiss in front of the cameras. No word on whether this is more than a friendship, however, Rodriguez, 35, came out as bisexual to Entertainment Weekly in October 2013. "I've gone both ways. I do as I please. I am too f--king curious to sit here and not try when I can. Men are intriguing. So are chicks," she said.